Happy Thanksgiving weekend to my Canadian readers! How will you spend it? I look forward to having my daughters and one son-in-law visit. Eight friends will join us on Saturday for a traditional dinner—turkey, ham, mashed potatoes, yams, stuffing, and everything else yummy. We’ll eat, play table games, and talk about the things for which we’re grateful. My family and friends. They’re alive too. What’s sweeter than to love and be loved? My husband—a man of integrity and prayer. My house—a safe, dry, warm place in which to live and practice hospitality. My health, and an affordable gym nearby where I can exercise rain or shine. The godly women with whom I participate in a weekly Bible study. Their transparency and love for Jesus inspires me. My Bible and the freedom to read it openly. God’s promises. They’re my anchor, hope, and light. 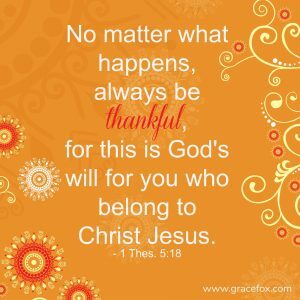 I thought you might enjoy several other quotes about gratitude by well-known Christian leaders. Take a few minutes this weekend to ponder their truth. Do you have a quote you’d like to share? For what are you grateful this weekend? Great quote, Ruth. Thanks for sharing it.